The VMD202 Vehicle Motion Detector is the most advanced single-piece vehicle motion sensor on the market today, and it’s so easy to use. Its probe and electronics are housed in a slim, water tight design which is buried next to a driveway. What sets the VMD202 apart from its competitors is the VMD202-R Sensitivity Remote Control: other vehicle detectors have a set sensitivity level, and if it’s not the level you need you’re out of luck. The VMD202-R plugs directly into the harness to allow tuning to one of 10 sensitivity levels, which is saved in non-volatile memory; so, even in a power failure, the sensitivity setting will be retained. 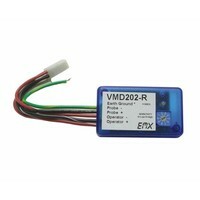 The VMD202-R can either be removed and used on other installations, or left in place for easy sensitivity level adjustments in the future.